Special Counsel Robert Mueller was interested in whether Paul Manafort provided the Trump campaign a “back channel to Russia,” a Justice Department lawyer has said. Justice Department attorney Michael Dreeben made the omission in a hearing where Mr Manafort’s attorneys were trying to have the charges against the former Trump campaign manager dropped. Mr Manafort’s attorneys claim Mr Mueller stepped outside the scope of his investigation when he brought money laundering and conspiracy charges against Mr Manafort. The charges were related to political consulting work Mr Manafort did in Ukraine for more than a decade. Mr Mueller’s defence team argued that investigating Mr Manafort’s business dealings in Ukraine was well within the scope of the investigation, because of Mr Manafort’s influential role in the Trump campaign. Mr Dreeben said the special counsel may have wanted to investigate the former campaign manager’s connections to foreign leaders, and whether they could have provided a back channel. “Here you have somebody who was a campaign official in the Trump campaign, where he had longstanding ties to Russia-backed politicians in the Ukraine,” Mr Dreeben said of Mr Manafort, according to the Associated Press. Mr Manafort worked with Ukraine President Victor Yanukovych and Russian aluminium magnate Oleg Deripaska, among others, before joining the Trump campaign. He was indicted on 12 charges of money-laundering and conspiracy in October – the first charges to come from the special counsel’s investigation of possible Trump campaign ties to Russia. 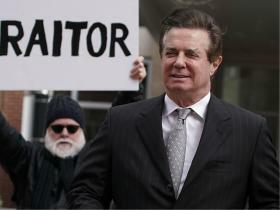 Mr Manafort pleaded not guilty. Lawyers for the former campaign chairman claim Mr Mueller was given a “blank check” by Deputy Attorney General Rod Rosenstein, who they say wrote an overly broad authorisation order for the entire special counsel probe. His lawyers were especially concerned by a recently released memo written in August, which shows that the deputy attorney general personally authorised Mr Mueller to investigate whether Mr Manafort “committed a crime or crimes by colluding with Russian government officials”. Mr Manafort’s attorney’s claim the deputy attorney general failed to put the rationale for investigating Mr Manafort into writing at the time Mr Mueller was appointed. The memo, they say, was written “after the fact,” in order to justify the investigation. Mr Dreeben responded by saying the memo was a “confirmation” of what prosecutors were thinking about Mr Manafort when Mr Mueller was appointed, according to Bloomberg News. Mr Manafort is scheduled for a criminal trial date in July in Virginia, and another in September in Washington.